The way Hunter Renfrow sees it, he became a college receiver because his mom, Suzanne, was a terrible quarterback. Really. Growing up in Myrtle Beach, S.C., Hunter, whose father was a high school football coach, begged Suzanne to throw passes so he could work on his route running. Little did he know all his practice would result in him having good hands, too. "She's not the best athlete in the world," Hunter laughs. "I had to learn how to adjust to the ball—a lot." "He didn't get discouraged, though," Suzanne says. "If anything, he's persistent." Hunter's 68 cousins (seriously) also played a role in his development: Compared to getting open in the backyard with family members draped all over him—with no pass interference flags to help him out—getting open against ACC defenses is a breeze. Renfrow caught plenty of scoring passes in backyard brawls at Thanksgiving and Christmas, and at family barbecues (the Renfrow clan is comprised of 11 families, with 48 children and 20 grandchildren). But the Clemson redshirt freshman scored his most memorable touchdown on Sept. 17, when he hauled in a 32-yard pass from sophomore quarterback Deshaun Watson and skipped into the end zone for the 12th-ranked Tigers' first score in a 20–17 victory over Louisville. It was the first touchdown reception of Renfrow's collegiate career. "Seeing the end zone for the first time, that's something you'll never forget," he says. "Celebrating with your teammates, watching it again later …"
The feeling was worth the wait. Renfrow arrived at Clemson last summer, standing 5' 10", weighing just 155 pounds and boasting minimal receiving experience. At Socastee High in Myrtle Beach, where his father, Tim, was the football coach, the Braves ran the triple option and Renfrow played quarterback. Georgia Tech briefly showed interest until, he says, "I stopped growing." Having "small little hands" that didn't deliver perfect spirals counted against him, too. A standout prep baseball player, Renfrow had multiple scholarship offers to play both football and baseball at the FCS level. Small-school success runs in his genes: Tim had been a standout shortstop and cornerback at Wofford College in Spartanburg, S.C., and still holds career records at the school for stolen bases (84) and interceptions (19). Renfrow also liked the Tigers because Swinney wasn't the only coach with a history as a walk-on. Co-offensive coordinator Tony Elliott and tight ends coach Danny Pearman had both walked on at Clemson, in the late 1990s and late '80s, respectively. "This is the best place in the world to be a walk-on," Renfrow says. "You're treated just like everyone else." 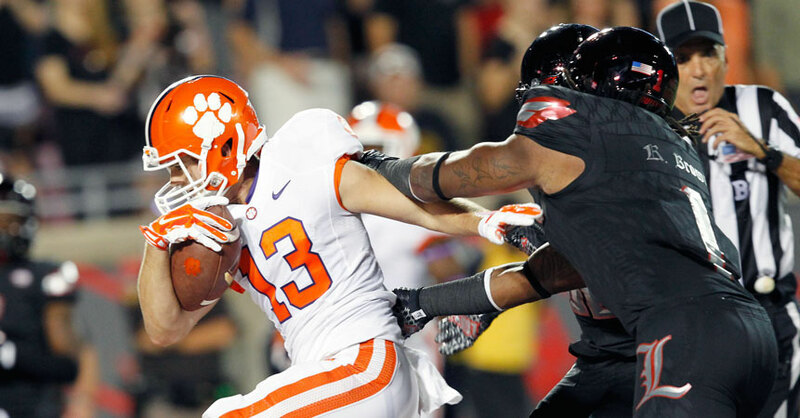 Renfrow enrolled in June 2014 and redshirted last season. On Aug. 15, Swinney awarded him a scholarship, news that brought Renfrow, who now weighs 176 pounds, joy and relief: "If I didn't get a scholarship I was eventually going to have to get a job," he says. "I was extra motivated." Adds his father: "We have six kids, so it sure helped out mom and dad's pocketbook!" Renfrow's parents never worried about big-time college football breaking their son's heart. Though many walk-ons spend their days as glorified practice players, both Tim and Suzanne believed that their fourth child was capable of more. They'd watched him play long games of catch with his cousins—"The good thing about that many kids is, there's always someone to play with," Suzanne says—and didn't want him to spend years wondering, What if? Mostly, they trusted his gritty determination. As a longtime high school coach, Tim—who coached at Socastee for 10 years, from when Hunter was seven until he was 17, and now works as the Braves' athletic director—knows collegiate-level talent when he sees it. But with his own child, he hesitated jumping to conclusions. It wasn't until Hunter was in ninth grade, during Socastee's spring game, that Tim realized how good his son could be. "He just did some things with the ball in his hands, making people miss, stuff that's natural," Tim says. "At the time, he was playing quarterback and my assistant coaches told me maybe 15 times, 'Hunter's gonna be a player.' People around him saw it before me." Some days, Hunter desperately misses baseball. To deal with it he will round up teammates and head for the batting cages, where Watson typically outshines everyone. "No surprise," Renfrow says. Now that he's on a football scholarship, Renfrow says he is open to the idea of playing both sports for the Tigers, but he hasn't yet discussed the idea with either Swinney or baseball coach Monte Lee. Renfrow credits Pearman with helping him became a contributor. Pearman, the former walk-on, prepped Renfrow in 2014 for his first year, and assured him that all the hard work was going to pay off, that all the sweat was going to be worth it. With a laugh, Renfrow says it was actually a lot easier than Pearman had made it sound. Through three games this fall, Renfrow has caught six passes for 73 yards, including two receptions for 25 yards in the Tigers' opening game, a 49–10 win over Wofford, his dad's alma mater. "The thing that's shocked me is not what he's done in game, but what he does at practice," Pearman says. "There are times I walk away thinking, 'Wow, that was a really good route,' then I watch the film, and he's getting open against Mackenzie Alexander, our best corner. Pretty early on I thought, 'This kid is gonna translate to the field.'" Renfrow had told his parents not make the 12-hour drive to Louisville for the game against the Cardinals, especially since there was no guarantee that he was going to see the field. But they hopped in the car anyway, leaving Wednesday night and arriving early Thursday. Considering he scored his first touchdown in the second quarter, Renfrow is now glad they didn't listen to him. This weekend, when Clemson (3–0) hosts No. 6 Notre Dame, Tim and Suzanne will be in attendance. Memorial Stadium is only a five-hour drive from their home. And Suzanne, Hunter's first quarterback, needs to see if her favorite receiver has perfected his routes. Should he need to adjust and dive for any passes, she's sure he'll be able to snag them. Know of a good walk-on story in college football? Lindsay Schnell wants to hear it. Email her at SIwalkon@gmail.com.